32 community-based organizations that provide assistance to underserved entrepreneurs across the United States are set to receive a combined $5 million in grants from the U.S. Small Business Administration’s Program for Investment in Micro-Entrepreneurs (PRIME). These organizations help low-income entrepreneurs gain access to capital to establish and expand their small businesses. This year’s 32 recipients come from 24 states and the District of Columbia. 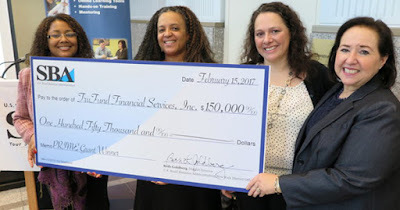 The grants range from $75,000 to $250,000 and typically require at least 50 percent in matching funds or in-kind contributions. In total, 111 organizations applied for PRIME grants for 2018. The SBA placed special emphasis in this year’s competition on projects that will offer training and technical assistance to strengthen economically disadvantaged businesses, particularly those that service entrepreneurs in rural areas and HubZones. This year’s awards also emphasized organizations participating in the SBA’s Community Advantage Program. This program provides mission-oriented, nonprofit lenders access to the SBA’s 7(a) loan guarantees to help small businesses that have outgrown microlending but are not able to access more traditional financing including funding from SBA commercial lending partners. Eight Community Advantage Lenders were selected for PRIME grant awards. PRIME was created by Congress as part of the Program for Investment in the Micro-Entrepreneurs Act of 1999. Grant funds will be made available on September 30, 2018, and the project period for each grant is one year. For more information on the SBA’s PRIME grants and for a list of this year’s grantees, go online to www.sba.gov/content/prime-grantees.